Information: The successful M7 class was introduced in 1897 by the London South Western Railway (LSWR) primarily for hauling heavy commuter trains in and out of London. In later years the class was distributed through-out the Southern Region of British Railways for operation of branch line traffic, while many remained in their home territory hauling empty stock workings in the busy London area. Details: By 1890 London commuter traffic was growing at a pace requiring larger and more powerful locomotives. Dugald Drummond had recently been appointed Mechanical Engineer with the LSWR after gaining work experience from railway companies in both his native Scotland and further afield in Australia. The LSWR required more powerful locomotives to support the increase of commuter traffic from the southern suburbs into London. 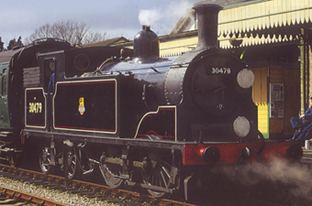 The resulting M7 class was the largest and heaviest 0-4-4T to ever be used in Britain. Between 1897 and 1911, 105 examples were built in five batches with the majority constructed at Nine Elms Locomotive Works with the remainder being built at Eastleigh. Variations between the batches were both internal and external in appearance; the most obvious external difference being the length of frame and resulting front end over-hang. Many members were fitted for push-pull operation making the class even more versatile for their intended service. By 1948, when the successors to the LSWR, Southern Railways was incorporated into British Railways all but one member remained in active service. During the same year number (30) 672 was involved in an accident and cut-up. The remainder lasted until 1957 when the class fell victim of the Modernisation Plan. By 1964 the entire class had been taken-out of service as branch lines were decimated and remaining local services were taken over by DMU’s; while stock workings were increasingly handled by Class 09 diesel shunters. Colourful liveries, typical of passenger locomotives adorned these locomotives through LSWR and Southern ownership. Under British Railways ownership the class was gradually repainted in somber mixed traffic lined black livery. Two members survived into preservation. Number (30)245 was withdrawn in 1962 and allocated a place with the National Railway Museum for posterity. Number (30)053 being sold to Steamtown USA in 1967, where it remained as a non-working display until repatriated with the Swanage Heritage Railway in Dorset in 1987, where it has since been restored to fully operational status.